Florence, Uffizi, no. 1890.8309 (on loan to Arezzo, Museo Communale). A depressed area with a very clear edge appears left of the center of the Virgin’s face, extends from over her right brow and downward at the left, then turns back across the landscape and terminates on her chest just above the edge of her dress, suggesting a change in the position of her head. (Bologna and Causa, 1952, see below, indicated that an x-ray shows another face under the visible one). Similar evidence on the surface of the painting is visible from the Virgin’s right hand, across the thigh of the Child and ending just below the left hand of the Virgin, clearly indicating a passage of drapery was originally painted here. The changes that were made seem to be part of the original state of the picture. In general the condition of the painting seems fair although the paint surface is much corroded and flaking in the darkest areas. The Virgin’s face seems repainted from the chin to the ear. The Madonna’s upper garment is a slightly orange red going to very pale pink. Yellow ochre decorative band at the neckline, with a white undergarment seen just above it also visible at the wrist. Her skirt is sea green becoming bleached at the knee; the decorative border is yellow ochre. Her head scarf is very gray brushed with pink, with a yellow ochre edge. The color of the drapery under the Virgin’s right hand is similar to that of her head scarf but a somewhat darker blue gray, again with a yellow ochre edge. The drapery under her left hand, which would seem to be part of the drapery under her right hand, has a greenish cast. Her hair is tan. The Child’s body seems to have a light gray underpainting. The cheeks, ears, and fingers of the figures are pink as are the toes and knee of the Child. The roofs are pinkish. A. M. Ciaranfi, “Alcune opere del Beccafumi,” Bullettino Senese di Storia Patria, V, 1934, 1-12, as Beccafumi. Barocchi, 1950, 254, recorded that Becherucci had told her of the picture in the Uffizi storerooms as by Rosso. Longhi, 1951, 59 (1976, 99), as Rosso, as a replica of his picture in the Borghese in Rome, and as exhibited in Arezzo since around 1940. Bologna and Causa, 1952, 3-4, no. 1, Pl. 1, as Rosso. Bertini, 1952, 147, 148, Fig., as Rosso. Longhi, 1953, 8, as Rosso, and as done shortly before the Borghese picture of around 1514. Briganti, 1953, 51-52, as Rosso. Baldini, in Mostra del Pontormo, 1956, 125, no. 155, Pl. 94, as Rosso, accepting Longhi’s attribution and dating. Gamba, 1957, 7-9, 12, Fig. 2, as by Antonio di Donnino. Shearman, 1957, II, 214, n. 2, as by Beccafumi, who also did the picture in the Borghese. Barocchi, 1958, 236, questioned the attribution to Rosso, finding the landscape perhaps not ascribable to his hand. Berti, 1961, 35, 62, Fig., as attributed to Rosso around 1514 and related to the picture in the Borghese. Luciano Berti, in Pittura del Cinquecento, Milan, 1961, 149, as not able to judge. Freedberg, 1961, I, 248-249, 607, II, Fig. 326, as Rosso, around 1513. Zeri, 1962, 227-228, 229, Fig. 16, as by the Master of the Kress Landscapes, around 1510 or slightly later. Carroll, 1964 (1976), I, Bk. I, 12, Bk. II, 1-73, 92-94, P. 3, II, Bk. III, Fig. 5, as Rosso, around 1513-1514; “Addition to the Preface,” 1976, vii, as not by Rosso. 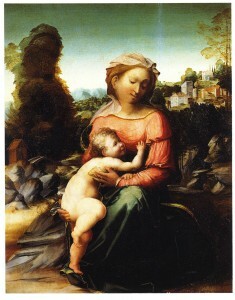 Borgo, 1968 (1976), 168, 169, as Anonymous, and related to the Madonna and Child at Bucknell [RP.11] and the Holy Family in the Borghese Gallery in Rome [RP.21]. Freedberg, 1971, 484, n. 21, agreed with Zeri’s attribution. Freedberg, 1972, I, 629, as by the Master of the Kress Landscapes. Ragghianti, 1972, 44, without specifically mentioning the picture, stated that he agreed with Zeri’s attributions of the pictures that had been given to the early Rosso. Ward, 1982, 364, under no. 324, as by the Master of the Kress Landscapes (and as about the same date as a drawing by Bandinelli in the Louvre, Inv. 96, his Fig. 17). Berti, 1983, 45-46, as given by Zeri to the Master of the Kress Landscapes. Wilmes, 1985, 87-93, Fig. 2, as by the Master of the Kress Landscapes. Fischer, 1986, 156, under no. 97, as by the young Rosso, the background group of buildings derived from a drawing by the young Fra Bartolommeo. Fischer, 1989, 328-329, 332, 333, Fig. 41, Fig. 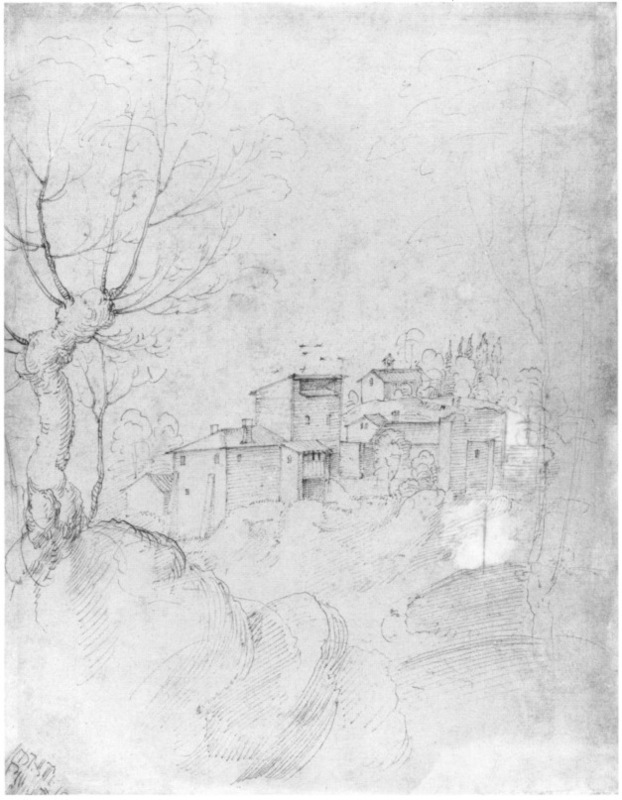 42, as by the Master of the Kress Landscapes, the buildings at the upper right derived from a drawing by Fra Bartolommeo. Franklin, 1994, 8, with reference to Zeri’s attribution to the Master of the Kress Landscapes. Brilli, 1994, 145, Color Pl., 146, as by the Master of the Kress Landscapes. Casciu, 1994, 28, 29, Color Fig., 30-31, no. 10, as by the Master of the Kress Landscapes, and datable 1510-1512. Ciardi, 1994, 58, 86, ns. 133 and 134, the attribution still a problem. Capretti, 1996, 153, 155, noted the “perplessità sull’attribuzione” of the Arezzo painting. 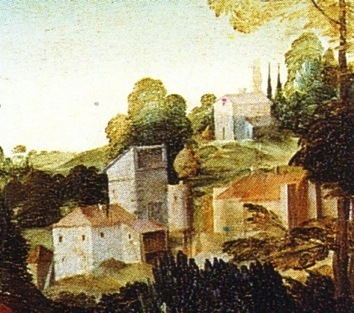 Waldman, 1998, 465 and n. 65, as by Giovanni Larciani, the group of buildings in the background derived from a drawing by Fra Bartolommeo, as recognized by Fischer, 1989 (see above). There is now general agreement that the painting is not by Rosso but by the artist whom Zeri recognized as the Master of the Kress Landscapes. He dated the picture around 1510 or shortly thereafter. Waldman identified this artist as Giovanni Larciani. Fischer dated the group of drawings by Fra Bartolommeo, of which the drawing used here for the background is one (Fig.Fra Bartolommeo, drawing), between c. 1495 and 1508.